Even before the May 1 groundbreaking, Lord of Life Lutheran Church had a waiting list for the congregation’s new Early Childhood Center in Elkhorn, Nebraska. That western Omaha community is “exploding” with growth, but many young families are finding no quality, faith-based childcare. Today, this “not huge” congregation is building a new addition for a new ministry—“stepping out in faith,” the pastor says, with the help of LCEF. Lord of Life could see families building homes and elementary schools under construction. But they were unsure how best to connect with these new people and share the Gospel. LCEF’s VisionPath “helped us narrow down and focus on the mission of our church,” Linkugel said of the VisionPath experience the congregation used to clarify ministry passion, align their purpose and move into action. Already a church with strong children’s ministries, the congregation decided to move forward with its vision – to provide the best early childhood education and care that shares the love of Jesus. Now Lord of Life is in the midst of a capital campaign with the help of LCEF’s Capital Funding Services. “Having another Lutheran pastor who has kept our focus not on raising money but on growing in faith and how we can live that faith and serve our community has made a difference,” Linkugel said of Capital Funding Services’ Rev. Dr. John Sproul, who is guiding the congregation through the three-year, biblically based campaign. Funding for the $1.8 million addition is being provided by Lord of Life members and an LCEF loan. 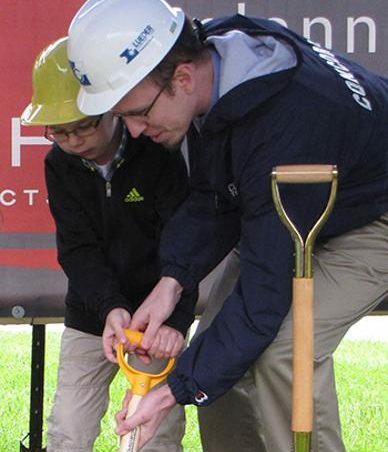 Despite a rainy Sunday, spirits were bright at the Early Childhood Education Center groundbreaking May 1. Many youngsters were on hand, with several sporting yellow construction helmets. The two-story addition will accommodate the early childhood program and also provide needed space for the growing church, including meeting and Bible study rooms and offices. Also taking part were the Rev. Caleb Kruse, Lord of Life’s associate pastor; Paul Pettit, LCMS Nebraska District treasurer; and Nate Meier, LCEF Nebraska District Vice President. The new center is expected to open in January to serve 67 youngsters, from infants through preschoolers. John Sproul predicts an enthusiastic response to quickly put the ministry at capacity.